When a forest fire threatened Wasagamack, MB in August 2017, Eugene Harper devoted his time and energy to saving his community. 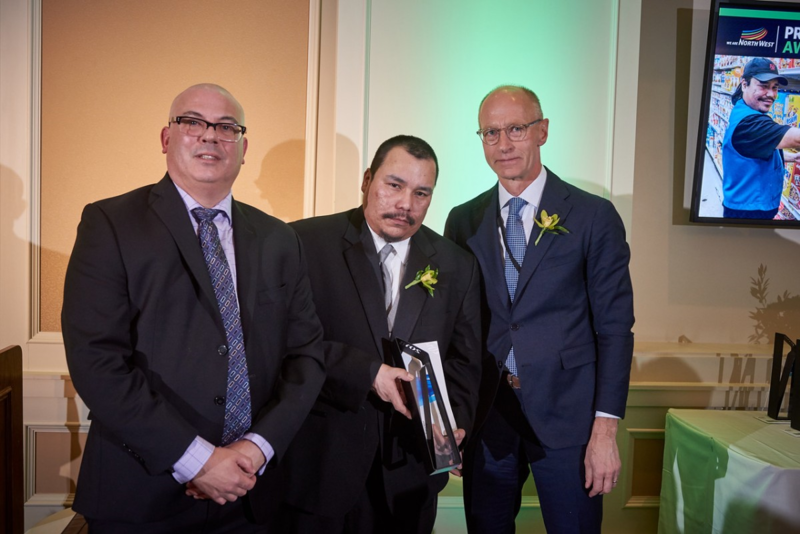 His dedication and bravery earned the Northern store grocery department manager a 2018 President’s Award, which The North West Company awards to outstanding individuals and teams within the company each year. Eugene has proven to be a very helpful and resourceful person to both the Northern store staff and Wasagamack community members. From sawing through ice to access water pumps, to fixing broken vehicles, to helping customers carry groceries to the local boat dock, Eugene has reinforced his reputation as someone the store and the community can rely on in times of need. Last summer, Eugene’s loyalty was on full display. When a 25,000 hectare forest fire came within three kilometers of the community and led to a full evacuation, Eugene stayed behind with a small group of people. As his family traveled to safety, Eugene ensured the local firefighters had enough food and water to support their work. Eugene also assisted with local fire prevention efforts. As hot ash was falling on the community, burning most of the small islands surrounding the store, Eugene barely slept, working tirelessly day and night to assist the firefighters to extinguish small fires that were threatening people’s homes and personal property. Eugene put the community’s best interest at the forefront, as he knew he was protecting the only grocery store in the community. The North West Company held a ceremony in Winnipeg on January 29 to honour Eugene and the many others who have displayed The North West Company's core values within their work.